Has this ever happened to you as a reader? Recently I read in a novel with a powerful plot and well-drawn characters. I was absorbed, loving every single moment.... and then the main character did something stupid. Something that no reasonable person would have done in that situation; something that was bound to go wrong; something that frankly she was too intelligent to do.... But she did it, because, had she done the sensible thing, it would have cut off an important plot-strand. I hate plot-driven moments. They spoil a book. In order to be compelling and credible, a plot has be driven along by character. As soon as a character is forced to do something because it suits the mechanics of the plot, the book loses not only its impact but also its credibility. 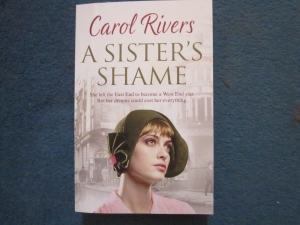 In the case of the book I am talking about, it was brought home to me even more forcefully because I had just re-read A Sister's Shame by saga-writer Carol Rivers. In A Sister's Shame, the drama is driven along by the various characters - their personalities, their dreams, their strengths and weaknesses. All the characters, including the those with apparently minor parts to play, have their own effect on the plot, especially the gentle, honourable Wippet. The strength of the characterisation adds depth to the various relationships depicted, especially the romances of the book's two leading ladies, twins Marie and Vesta. Their relationships are central to the unfolding of the action, as one of them finds stability and lasting love while the other rushes headlong into what she thinks is true romance, only to find herself being ruthlessly controlled. 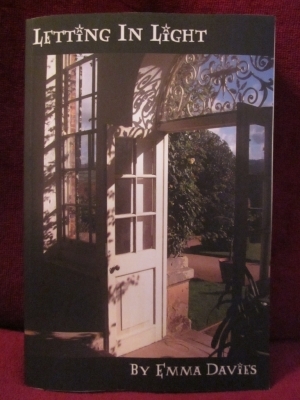 The wonderful Letting in Light by Emma Davies is another novel which is entirely character-driven. It is a book which conducts a deep exploration of the characters and their emotional truths, whether they want to face up to those truths or not, and immerses the reader in emotion as friends old and new band together to work on creating a community project. What do you think? Would a plot-driven moment spoil a book for you? Who are your favourite characters? And which authors do you trust to deliver a great read every time? Do leave a comment and let me know. Listening to your characters and letting them take you where they want to go has enabled you to create a very special book in Letting in Light, Emma. Changing the characters to fit the plot weakens both, but changing the plot to fit the characters strengths both. Thanks for sharing your thoughts. Thank you so much for your lovely comments Susanna. I never feel I truly connect with a book unless I feel in tune with the characters, so I think it's instinctive for me to write this way. I've certainly never changed the characters to fit the plot, but I've often changed the plot to fit the characters - they have a habit of doing that to me! Jan, I know you are embroiled in editing your novel at the moment and I'm delighted if my blog has helped in any way. Getting to know the characters and understand them is an essential part of a novel. Good luck with your editing. I enjoyed your blog this week about you have learned from the editing process and I'm looking forward to the guest blogs on editing that you are about to host. A very interesting post, Susanna. One of the first things I learned about writing romance and women's fiction is that it's so character driven. Readers have to have an emotional connection with the characters first, and the external plot is usually of secondary importance (although it must be believable in terms of character goals, motivations and conflicts). Authors I trust to deliver a great read (albeit from very different perspectives) include Kristan Higgins, Julie Cohen and Karen White. An interesting post, Sue. The characters in a book are very important for me, too, especially where we can get inside the character's head and know what they're thinking. What this post has done for me, also, is to alert me to look at the decisions and actions my characters have taken in the novel I'm editing and hope they are not there just to further the plot. This is why a readers's perspective is so important when editing, isn't it? Thanks for recommending the books. Of course plot is important but if it's not driven by the characters in becomes two dimensional. A fabulous character-driven novel is The Promise by Ann Weisgarber. Thanks for your comments, Louise. I hadn't thought of this in terms of characters in films, but obviously the same thing applies. And do read the books - they're both excellent. I'm not sure whether a plot specifically needs to be character-driven, but it definitely needs to be logical and believable. This applies to films as well as books. A character who does something stupid is downright annoying. Thanks for an interesting post and also for the book recommendations.